Jeff Holmberg designed these labels for a new line of coffee from Bull Run Roasting Company to be served and sold at their new retail location inside the Rustica Bakery in Minneapolis. Top notch stuff! Bull Run wholesales their coffee into some of the finer restaurants in the metro. This Reserve Collection is the first offering of their coffee at retail and it had to look tasty. The label is customized by rubber stamping the coffee variety and hole punching the bean and weight information. The ripped edge of the label on the kraft bag balances a raw yet refined look. Nice work Jeff. We letterpress printed in two color on Strathmore Ultimate White label stock. 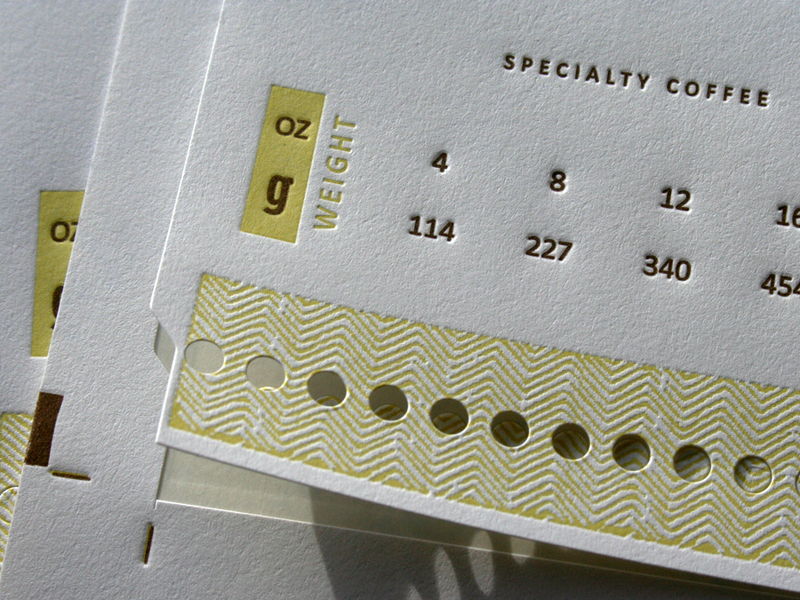 We kiss cut the labels with a steel rule die with several punches to add the coarse perforated edge when ripped and opened. Yum and Buzz.